The original Assemblance was an interesting experience for me. I picked it up when it originally released simply based on its mysterious premise and haunting tone. I soon found myself both intrigued and frustrated. Assemblance was a title that wasn’t going to give up any story details easily. There’s a lack of handholding, and then there’s Assemblance. Now, we have the sequel, Assemblance: Oversight. A seemingly new story with plenty of familiar themes is laid out before us, and once again the going isn’t easy. Should you take the time to unravel the threads of this dark science fiction tale? Let’s find out. 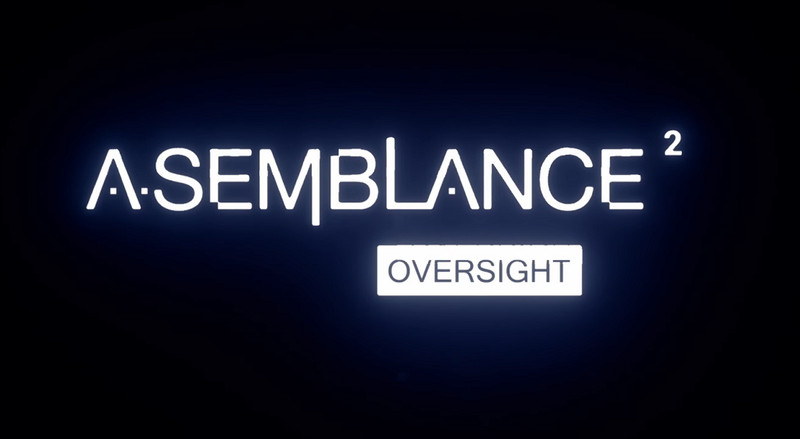 Assemblance: Oversight isn’t a difficult game to pick up and play. You walk around and use a single button to zoom in on objects. There’s some basic interaction with specific items in the world and a few other mechanics introduced later on in subsequent playthroughs, but the entire gist of the game is very easy to grasp. Much of the progression in Assemblance: Oversight is triggered by zooming in and looking at specific things in the environment. You return to a hub area between each outing, which looks identical to the hub from the first game in the series. By using a computer terminal, you can activate a holodeck of sorts that teleports you into memories. Once inside, you can exit at any time with the triangle button, but these memories are where you’ll uncover more answers and progress everything. Assemblance: Oversight is really about two things: exploration and experimentation. While there are some puzzles for you to solve, the true answers you seek lie beyond the game’s first ending. In fact, that first ending after about 45 minutes or so is just the beginning of your journey if you intend on seeing everything the game has to offer. By using the zoom mechanic, you’ll uncover additional triggers and new story segments that include everything from narration, to recordings, to strange hallucinations. The documents that are also scattered around on tables or pinned to bulletin boards can be read relatively easily if you zoom in on them. Part of what made the first game such a cult hit with gamers was the community that grew around trying to piece together the mystery. Indeed, you will need to leave the confines of the game to find some of the answers you seek and true understanding only lies in discussion and a lot of speculation. The fact that Assemblance: Oversight never really opens up to the player is both a unique change of pace and a frustrating element of this series. I like hunting down clues as much as the next person, but some sort of satisfying conclusion or light at the end of the tunnel is something I feel like stories need to reward the player for getting through all of its hurdles. Of course, that’s just an opinion. You can still have a great story, even if it doesn’t ever truly answer your questions. I’m all for an ambiguous ending that makes you think, but I do feel like Assemblance: Oversight flirts with the line between thought-provoking and just plain holding out on answers. Whether it falls on either side of the line will be up to you, but I feel like this formula could use a little shaking up in a third title so it doesn’t become stale. Keep in mind too, before you cry foul at the length, that this game is under $10 even when it’s not on sale. I think there’s a solid amount of content here, especially for those who dig for every ending. I just wish all that digging came with a few more nuggets of knowledge to make the effort feel more worthwhile. Assemblance: Oversight is a beautiful looking game with some nice variety in the environments. There’s a beautiful use of color and visual effects as you dive deeper into the various endings that really gives you a visual dissonance that adds to the haunting and generally creepy atmosphere. Assemblance: Oversight is a sci-fi horror, but I wouldn’t call it scary per se. Instead, I would call it atmospheric and unsettling. There’s always this feeling that something just isn’t quite right. That uncomfortable feeling permeates the entire experience, and it keeps you on the edge of your seat as a result. While it may not differ too much from the formula of the first title, Assemblance: Oversight continues the series in similar fashion with a truly unsettling atmosphere and a fresh mystery for the community to pick apart and discuss until the next title releases. Here’s hoping the next one finally offers us some definitive answers, but odds are it will most likely continue with this formula. If you loved it in the first game, you’ll love it here. Newcomers, however, should consider how much time and effort they want to put in for some semblance of definitive answers.